Elevating the perception of beer and food, one bite at a time. Last summer I bought myself a smoker. An impulse buy that came after procuring a beautiful piece of pork belly (destined to become smokey bacon) and immediately feeling frustrated about not being able to smoke at home. Enough was enough - I needed smoke! I careened into the nearest Home Depot and bought a Brinkmann Sportsman Charcoal Smoker. In all honesty, it's not the king of smokers (one day I WILL get a Big Green Egg) but for small, compact city living, it does the job. If you have this model or something similar just be sure you monitor the temperature closely so as not to get too much direct heat. 200-215 degrees F is ideal. One of my favorite things to do in the summer is make sausages. At the risk of sounding piggish, I'd say Sarah and I eat them at least once a week, June-Septmeber. I have a small hand crank grinder/stuffer that's perfect for at-home use and has served me well for at least 7 years and counting. And what makes a sausage extra great? Why smoking of course! Well to be fair, there's many, many things that make sausage great but smoking is most certainly one of them! The Polish knew this when they developed the Kielbasa Polska (Polish Sausage) aka Kielbasa Starowiejska (Ancient Countryside Sausage) a smoked sausage that Americans have adopted with love. Thanks to a vibrant Polish community, kielbasa has become a staple food in Chicago and I, like any self respecting carnivorous Chicagoan, partake often. While the Chicago standard dictates kielbasa be served with yellow mustard, grilled onions and "sport" peppers, I like to mix it up with a variety of pickled summer vegetables. Asparagus, carrots, green beans - anything is fair game! Pickled vegetables are easy to make and their tanginess provides great contrast to the fatty, smokey meatiness of the kielbasa. 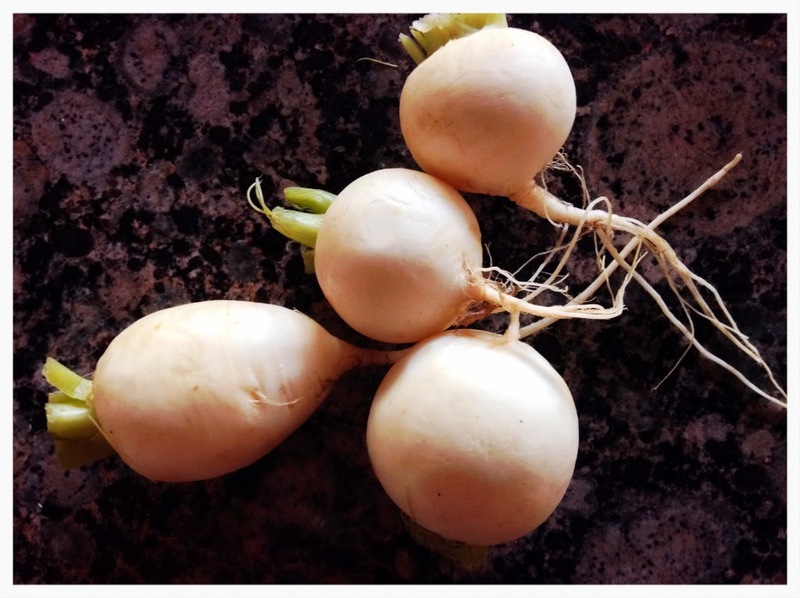 I lucked out with these baby turnips from City Farms which were not only beautiful but also pretty dynamite when pickled. I haven't yet posted any of my pickling recipes (SOON!) but here is a link with a bunch of solid ones. I had a decent amount (read A LOT) of sauerkraut left from last week's post which was a perfect addition to this colorful board. If you haven't used a hand crank sausage machine before if can take some getting used to. The real trick is keeping the blade and die sharp OR bypassing the grinding process by having your butcher pre grind the meat for you. Gentle load the casing onto the stuffing tube - natural casing is delicate and will tear. Keep a steady stream of meat passing through at all times to avoid air pockets. Also - and this is important - be sure to keep the meat as cold as possible. Refrigerate the meat before stuffing, assuring it gets good and cold. Once stuffed, let the formed links chill for at least an hour. This will keep the fat from separating. Separated fat makes for a mealy sausage and a mealy sausage is just plain bad. Grind pork shoulder with a coarse die or, if you have chosen to buy ground pork, move on to the next step. Emulsify all ingredients in a Kitchen aid (or other) stand mixer until all ingredients are fully incorporated. Carefully thread your pork casing or collagen on the sausage stuffer. Simultaneously winding the hand crank and supporting the forming link, case your sausage mixture into 5 oz. links (about 4 in. ), twisting to separate. If you would like to do larger links this will not change the smoking process. Bring the smoker to 200-215 degreesF. Make sure the smoker does not exceed 230 or the fat will separate from the meat, creating fatty pockets along the sides and resulting in mealy sausages. I prefer to use hickory or fruit woods for smoking because they produce a consistent flavor and even burning. Smoke to and internal temperature of 140F. Chill after smoking so the fat redistributes back throughout the sausages. Reheat in a sauté pan or on your grill. Enjoy with mustard, sauerkraut or any other wild variety of fermentables! This beer pours a beautiful orange with a creamy head that brings the aromas right to the nose. The flavor is somewhat whimsical thanks to a floral spiciness that comes with the sweet malty body. The dry hoppy finish creates a very well rounded. This pairing is a great contrast pairing because the kielbasa adds some smoke flavor that alters the sweet maltiness creating more depth as well as intensifying the spice from the yeast esters with the subtle spices in the sausage. Even the acidity from the fresh pickles contrasts the maltiness while the dry hop finish rounds out the finish on the palate.